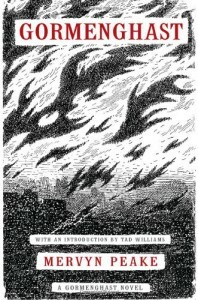 I think I'd only read Gormenghast (the book) once before, maybe twice, whereas I've read the first book, [b:Titus Groan|39063|Titus Groan (Gormenghast, #1)|Mervyn Peake|http://d202m5krfqbpi5.cloudfront.net/books/1327871204s/39063.jpg|3250394], multiple times. Unsurprisingly, I didn't remember this second book nearly as well as I did the first. The second book is also simply not as strong a book as the first. Titus Groan is chock full of dark images and heavy symbolism seen through an obscuring cloud of gloom. In Gormenghast, in contrast, Peake literally comes straight out and tells the reader what the symbols are. This is most evident in the first 50-100 pages, but also occurs toward the end, when Titus is making his plans for the future. One character, the 'Thing', is clearly created purely for symbolic purposes, and it's disconcerting that Peake removes all possibility of mystery by telling us exactly what the character's meaning is. That character is itself an awkward construct. While most of the new characters introduced in this book are decently put together - the Professors as a corps, and to some extent as individuals, some, such as this special one, seem more like afterthoughts. It's incongruous, then, for this one to play (we're told) such a central role on Titus' life. Peake does a nice job of reconnecting with other characters, and tieing them back into the castle's (and Titus') story. The Countess, the Bright Carvers, and the Doctor all play important roles. Flay, while central, seems less fully developed, which is odd, since it seems clear that Peake fully intended this return to prominence. Peake also resolves Fuchsia's plotline in a seemingly offhanded manner. The plot itself itself is interesting. Steerpike develops in a credible way. There's a key flood whose mechanics are questionable, but then Gormenghast is not tied too closely to reality. There's quite a lot of humor in the book. There are a number of consistency errors - several related to Fuchsia's age, and one to Titus' location - signs of rushed or limited editing, perhaps. And there are scattered instances of words misused ('flaunt' for 'flout'), which would be less surprising in a writer less careful than Peake. I've focused on the negative, because I found the book disappointing in comparison with its predecessor, but that's not to say it isn't a good read. All in all, it's a sturdy successor to Titus Groan, but lacking the magic of the first volume. Worth reading for people who were caught up in the characters that inhabit the castle, but less so for those who mainly liked the imagery.